@carolineschell and her sculpture works, as we might think that this is a job for men but Caroline shows us that even a woman using modern tools can create a beautiful figures out of marble. Nowadays working outside is freezing cold but nevertheless she is working hard and we can see beautiful results of her work. Thank you for this beautiful work! Next is one of newcomer to Steem, we would like to welcome @jakeknee who is visual Artist from Northern Ireland, we were absolutely fascinated with his works, but presenting today his work of King of Jungle: Lion, majestic and free. Beautifully done and there are steps of his works, that we try to encourage our Artists to do. Jake, as a hint there is an Artist supporting blog @NTopaz that you can upload your Artwork via their app. The quality works will be noticed and supported by @NTopaz curators. Beautiful watercolor done by @theyasemin, soft, harmony tones, great balance between the dark and light, our support! Extraordinary style of @jmvabreda, this is his way of creation that one can immediately recognize, Love it, very well done! The next Artist who we recently noticed thank the turmoil with the copyright battle and through our good friend Otto Rapp is Daniel Doyle or @ammonite, he is incredible in creation of figures, stories made of SAND, the whole compositions and the one that we presented today is reflecting a famous scene from Matrix. Absolutely amazing. You are the Master of Sand, Daniel and thank you for demonstrating your creations! The realistic Oil painting of Matthew @matteopaints is amazing! I can imagine that this must be a large format because it is difficult to do the figures and details on small one. Beautiful sunny day and every figure is done with love to details. Our admiration adn support! The next beautiful portrait is done by ball pen by @ebene06, amazing Artist from Nigeria, it is a real Art to create different shades with ball pen and at the end with such impressive result. Our support to you, Eben! @betzaelcorvo is another ball pen Artist, his works done mostly with blue pen and they are Top class realistic portrait! We always appreciated your work and now you are again in our Magazine! The next artist is @artemacarre from Venezuela, beautiful portrait drawing and we love your process steps, thank you for that and our support! Another artist from Venezuala @theonlyway, who presented beautiful Beta fish in watercolor, love the plastic of movement and color choice, well done. Dear Artist, we wanted mention that there is curator who supporting Art works @Ntopaz, please read their rules and upload your post via their site/app. You will get a good support, it is not enough only use NTopaz as a tag you should post via them. AND…… , please visit Art-venture contest that is run by @xpilar and @sultan-aceh, to choose the winner of Art-venture magazine issue N44. May be yourself is one who is included in it. 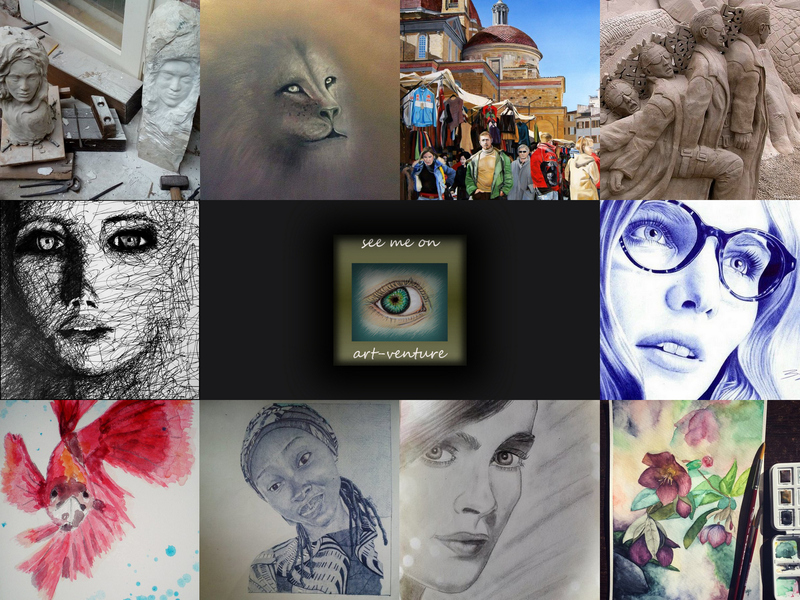 Wishing you all success, your @art-venture!